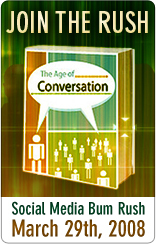 The Age of Conversation is an anthology of the bite-size nuggets of new media insights from 100+ marketing bloggers. If you’ve already got a copy, you can find me in chapter #11. All the profits go to Variety, The Children’s Charity. If you buy a copy, you won’t make my wallet any heavier but you’ll help some kids that really need it. Chris Wilson is spearheading the bum rush, and they’ve gotten it up as high as #53 at Amazon’s business section. It looks like it has slid a bit to #57. If you own a copy already, I’m sure adding your review over there would help people that are pondering whether to buy it or not. It’s been interesting to read some of the comments over at the thread on Digg. As marketing dynamics transform from a world one-to-many messages to many-to-many, how is spam going to be socially defined? DISCLOSURE BREEDS TRUST. John Chow’s post on blog credibility highlights the need for transparency in blogging and points out the often overlooked importance of the About page. As we all begin to use more and more social networks, a centralized “About Me” page is going to be more important. Identity is the foundation of trust — the more people know about you, anxiety is removed from the trust relationship. One of the things that has helped to instill trust in Chow by his readers in spite of his “slightly evil” money-making approaches is the radical openness he shares with readers about his dreams, monthly profits and even what he has for dinner. What is Bizquarium you ask? I think it’s going to be a fun project. The ultimate goal is to create a website that helps bloggers, niche marketers, and other webpreneurs make the most out of their website using WordPress and other online applications. There are many topics that I am passionate about such as user interface development, SEO, email marketing and website optimization that I would like to cover and I’d like to keep SMOblog more focused. If you have an interest in tricking out your blog or making more money online, pay me a visit over there and sign up for the Bizquarium RSS feed. Please don’t be scared away by the newbie look of it all when you get there — I’m starting with the default WordPress theme on purpose. The Bizquarium website is going to be built up on the blog step by step — starting from scratch. Of course, along the way I’ll be mixing it up by covering a broad mix of topics related to the overall goal. I’m interested in any feedback or suggestions that any of you may have in regards to Bizquarium. Feel free to comment on this post or on one of the ones over there. One of the best ways to promote your blog is to increase your exposure within your niche of the blogosphere. BlogRush has just arrived on the scene and promises to do exactly that with the added bonus that about the only thing you need to really do to get started is to signup for free, embed the widget in your sidebar, and pretty much forget about it. I’m going to string myself out on coffee and spend the next 24 hours straight promoting The Age of Conversation online. Not only do all profits from the book go to a worthy cause, the book itself is a virtual smorgasbord of inspiration and ideas from 100+ marketing professionals across the world.